After suffering from a lower than expected sale the retailers of the RIM’s Playbook are now offering a steep discount. Best Buy’s Canadian website and Staples were the first retailers to offer this discount. Staples is selling the low-end 16GB model for $299.99, which is $100 less than the original price, with another $100 mail-in rebate. Best Buy is offering a $100 store gift card and selling the product at the same price. BGR has also reported that Wal-mart is offering the tablet for $250 in an unadvertised sale. The company reported shipping of only 200,000 tablets in the last quarter which was too low from their expectations. As a result, Research in Motion’s co-CEO Mike Lazaridis vowed to drive sales by reducing the price which will help their retail partners to increase its sales. According to a mail to CNET RIM said that they are starting to see some of the retailers already has implemented some programs within the consumer channel for this model and they expect these promotions to continue till the holiday season. 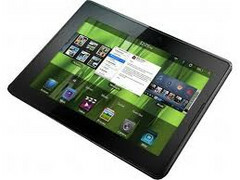 The 32GB model and the 64GB model of the playbook are also discounted to $399.99 and $499.99 respectively. This price reduction scheme seems to be working as the 16GB version of the Playbooks is sold out on the Best Buy Web site. After HP receiving a huge sale of TouchPads, at a discounted price of $99 the discount factor seems to be working for RIM as well. RIM also seems to have a large stock of devices as some news mentioned that their suppliers have supplied them 1.5 million units but they have shipped only 700,000 in the last two quarters. So they might have a great sale record this quarter.